UNLV was reeling. 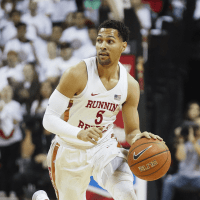 But Noah Robotham came to the rescue to help the Rebels snap a three-game losing streak by beating Boise State 83-72. Late in a tight game, it was Robotham closing out the Broncos. As UNLV finished the game on a 12-2 run, the senior had seven points and one assist, including this dagger of a three. Robotham had 21 points and 10 assists in the game, both of which were season highs. He hit 5 of 6 threes to lead another terrific shooting night. The Rebels hit 14 of 26 threes to outshoot a poor defensive performance. At least it was a poor defensive performance for UNLV over the first 37 minutes. But the Rebels put the clamps on Boise State. The Broncos missed four three pointers and turned the ball over twice in the final three minutes. Over the first 37 minutes, Boise State had hit 5 of 14 threes and only produced four turnovers. 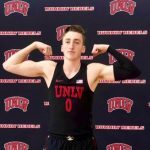 The Rebel win snapped a three-game losing streak that saw UNLV unable to compete against the top half of the Mountain West. UNLV had lost three-straight games, all by 17 points, to San Diego State, Nevada and Utah State. This win gave the Rebels their first victory over a team that does not have a losing record in conference play. UNLV had four players hit double figures. In addition to Robotham, Kris Clyburn (17), Amauri Hardy (15) and Nick Blair (14) all helped pour on the points. The Rebels were able to do it without Joel Ntambwe, who picked up two early fouls in the 1st half. Then the freshman committed this third foul with 18:37 left in the game. He never checked back in. Instead, walk-on Nick Blair took the bulk of the power forward minutes. And while he wasn’t the main reason for the turnaround, the Rebels outscored Boise State by 12 points with Blair on the floor. Next up is Fresno State, the third place team in the Mountain West. It is a return home for the Rebels with a Saturday afternoon game.